Ready to Launch Your New Offering? Order the full book, now available on Amazon. Did you know that 35-80% of launches fail? 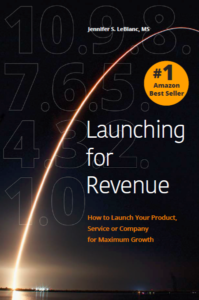 Learn how to ensure a successful launch with Launching for Revenue, a roadmap of case studies, examples, checklists, and self-assessment tools. Launching for Revenue is structured around the ThinkResults Launch Readiness Assessment, an assessment based on the ten critical elements we have identified and isolated that can make — or break — your launch.